If you just want to know the park entry fees, you will find the full list here and a summarized leaflet here. Note that non-residents are supposed to pay the entry fees in US dollars. The vehicle fee is always paid in Kenya shillings regardless of your nationality. If you are travelling on a package tour, you don't need to read what follows, since all this awkward stuff will be done for you by your safari company. However if you are travelling on your own, keep reading, since you need to know about the Safari Card. In the good old days of safari, you just had to reach the gate of a national park, pay your entry fee and get inside. That was all, as it still is for national parks in most countries of the world. In the year 2000, some genius at Kenya Wildlife Service (KWS) thought this was way too easy. Things should be much more complicated, and the best way to complicate them was an electronic chip debit card. The Smartcard system was invented, and with it, three separate concepts: the Point of Issue (POI), the place where you had to go get your card; the Point of Sale (POS), the place where you had to load money onto your card; and finally, the Point of Access (POA), the place where the money you had just loaded onto your card was unloaded by an officer belonging to the same body that the officer that had previously loaded the money onto your card and the officer that had given you the card on the first place. Of course, POI, POS and POA where conveniently separated, and so the safari gymkhana was born. And why all this? Well, who knows. KWS states in its website that there are five "major objectives". Only two of them are supposed to be set out thinking of you (the visitor), and they are mostly a single one (what is the difference between "enhance customer service delivery" and "improve Customer Relationship Management"?). Unofficially, everybody admits that there was one single objective: to curtail corruption. And it hasn't worked, as anybody can easily check just reading the news. Fortunately, another genius at KWS changed the name from Smartcard to Safari Card and decided that POI and POS could be merged in a single thing, and now we have POIPOS at all main gates of the parks where the system operates. This means that now you no longer have to go on a gymkhana, since everything can be done at the same place. That is: you reach the park gate. Some guy gives you a card. You give money to this guy. The guy loads the money onto your card. The guy unloads the money from your card. The guy gives you the card together with the park ticket and a receipt that are stapled to the rest of receipts you got from other parks. You end up carrying an empty card plus a bunch of stapled tickets. And don't lose any of them or you'll pay for it. Did I already say that Kenya doesn't love independent travellers? She's only dating you for your money. But we can't stop loving her anyway. Aberdare National Park, Headquarters (Mweiga, near Nyeri). Amboseli National Park, Meshanani (Namanga) Gate. Lake Nakuru National Park, Main Gate. Mombasa Marine Park Headquarters, next to Coast Provincial Headquarters offices. Nairobi National Park, Main Gate. Tsavo East National Park, Voi (Main Gate). Tsavo West National Park, Mtito Andei Gate. If you will be visiting one or more of these parks, you need to go to the POIPOS (Point of Issue - Point of Sale) at one of the parks. Ask for a Safari Card. There are eight different classes depending on whether you are a Kenyan citizen, a resident, a non-resident, a tour operator, and so on. You will be asked how many people travel with you, how many vehicles and how many days you will be staying in which parks. One card is valid for all passengers in a vehicle, but note that if you are travelling in several vehicles, each vehicle must have its own card which pays for the vehicle and its passengers. If you are a non-resident, your card will not be personal but a temporary one. You will use it during your whole stay but you will have to give it back when you finish your trip. After paying the fees corresponding to your planned stays at the parks where Safari Card operates, your card will be loaded with that total amount. Now you are ready to visit the parks. When entering each park you don't need to use a particular gate, since all gates are POA (Point of Access). At the gate you will have to hand your card (and all the stapled receipts) to the rangers at the gate, they will unload the amount corresponding to your full stay at that particular park, and they will give the card back to you, together with your bunch of receipts. 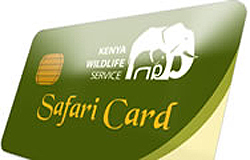 One important note: KWS's rules on Safari Cards state that a separate card is needed for each park in the case of non-residents. That is, you get a card in Amboseli, you use it only for Amboseli and you surrender it on exit, and if afterwards you travel to Aberdare you will get a new card there. This is the way it's supposed to be. But at least in my case, I have been allowed to get a single card for whole stays. The money loaded onto the card is not refundable, so don't load more than the amount you need, or if you are unsure about your travel plan, load only for the parks you are sure you will visit. The card can be reloaded at any POIPOS as needed, or even at POA as long as there is still some credit on it. Another important note: a day's fee is valid for 24 hours of continuous stay inside the park. If you exit the park before finishing the 24 hour period, your fee will expire and you will not be allowed back into the park unless paying another 24 hours. And this is even more Machiavellian: if you exceed your 24 hour period by ONE SINGLE SECOND, you will be charged an overstay of 24 full hours! !